I found a beautiful piece of coral on Miami Beach several months ago and I have been wearing it around my neck ever since. 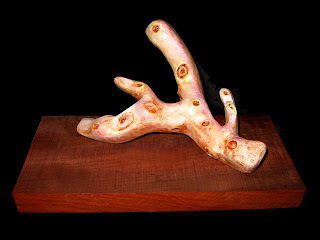 I am completely enamored with the form so I decided to use the fused deposition modeling project to abstract and recreate the small coral piece on a slightly larger scale for the table. 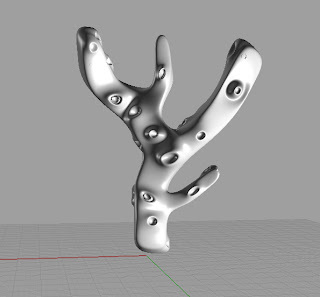 The FDM process is really great when I think about how it can be used for casting. I would ultimately want to cast this in both bronze and in plaster. For now, here it is painted and mounted on mahogany. I designed this piece to stand up straight and then a good friend came along and knocked it over. Best thing that ever happened to it. 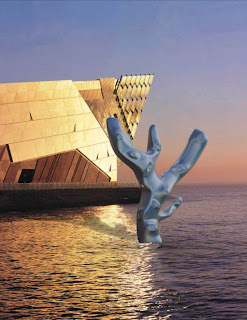 This is my rendering of the Coral FDM that I printed. 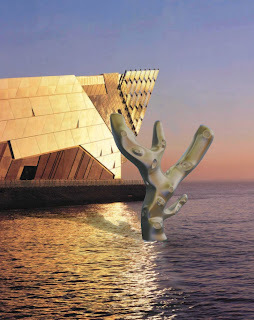 I placed it outside of the "The Deep"- An aquarium in Hull, East Yorkshire that was designed by Sir Terry Farrell. I couldnt decide which color I liked better so I posted both.